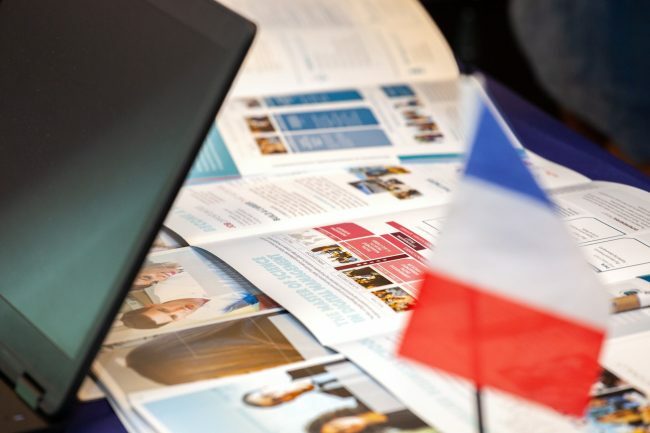 The third annual Study in France Education Fair opened on 23 March 2019 and welcomed a great number of students and their parents. Also present were more than 30 renowned French universities and higher education institutions* offering a wide range of courses in such divers fields as business management, social sciences, French language, fashion, design and engineering. School representatives were on hand to provide personalized advice on entry requirements, the curriculum offered and student life on their campuses. Impromptu small group meetings helped to facilitate lively exchanges in more intimate surroundings making this event a true success. However, it was not all serious discussions. Participants joined some fun and games and everyone left with a little souvenir. Participants had the chance to take home a nice photo at the booth set up by Campus France. Many also tried their luck at the wheel of fortune and walked away with amazing prizes. To remember this event, follow this link to the gallery of photos here. If you missed this Fair, do not hesitate to email us at study@ambafrance-sg.org or if you are interested in any of the schools, do contact them directly on their respective websites. * The schools which participated included Audencia Business School, Azurlingua Nice, Centre de Linguistique Appliquée of Université de Franche-Comté, Le Cordon Bleu Paris, EDHEC Business School, ENSTA Paristech, ESSCA School of Management, ESSEC Business School, Grenoble EM, IÉSEG School of Management, Inflexyon, Isae Supaero, Istituto Marangoni Paris, Montpellier Business School, IAE Pau-Bayonne, SKEMA Business School, Strate École de Design, TBS Business School, Université de Cergy-Pontoise and Université de Pau.